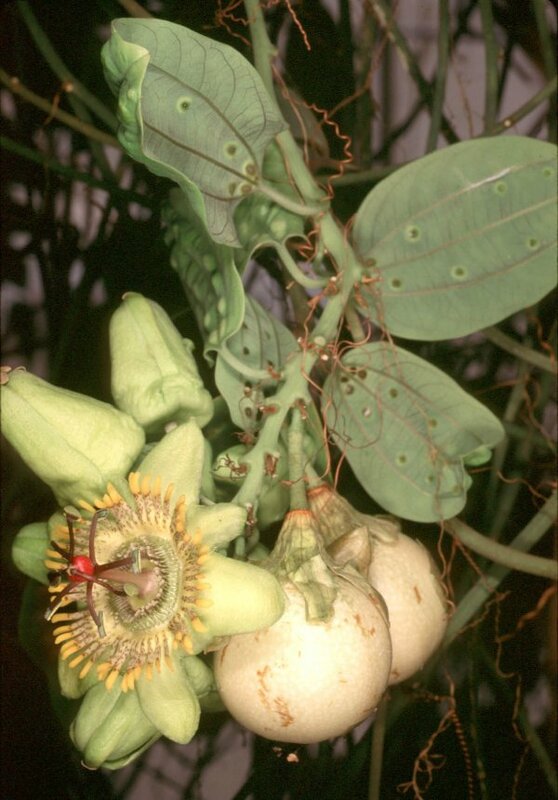 Passiflora Subg. Decaloba (DC.) Rchb. Consp. Regn. Veg. 132. 1828. Basionym: Passiflora sect. Decaloba DC. Mem. Soc. Phys. Geneve 1: 435. 1822. 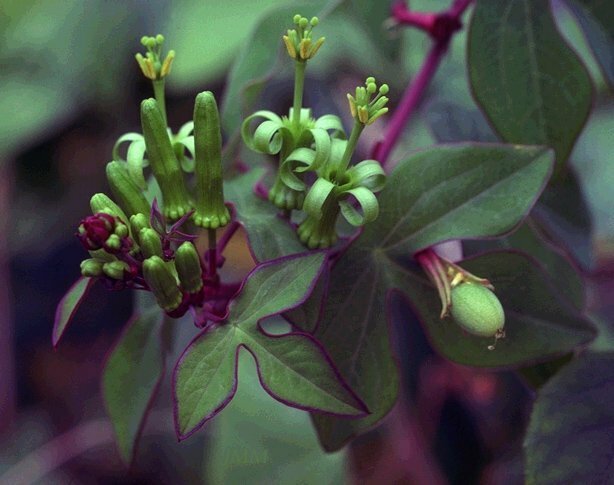 Woody vines or canopy lianas to small climbers, perennials or rarely annuals; plants glabrous to very pubescent. Stem terete, striate, grooved, angulate, or 3-5-angled; posture of new growth at shoot tip cernuous or erect. Stipules setaceous, subulate, or narrowly falcate, sometimes foliose. Leaves with palmate venation, often with 3 main veins, trilobed, bilobed (the center vein then shortest), or unlobed, often variegated in juveniles; leaf margins entire or rarely dentate to serrate; petiolar nectaries 2 (4+) and raised up from the petiole, or absent; laminar nectaries marginal, submarginal, or as dots between the main veins, or sometimes absent. Prophylls of vegetative bud 1, 2, or rarely more. Primary floral peduncle present (only in 3 spp. of supersect. 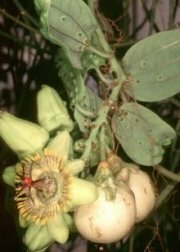 Pterosperma) or usually (reduced and) absent, therefore tendrils either borne from inflorescence or usually sessile-axillary; (secondary order) peduncles 3-bracteate, 1-20-flowered. 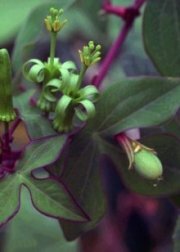 Flowers generally less than 4 cm diam., mostly greenish-white, rarely red, floral cup/hypanthium shallow, rarely with a floral tube; petals in size similar to sepals, or much reduced, occasionally absent; coronal filaments in (1) 2-3 (4) series, usually yellowish or whitish, sometimes with red to purplish bands, especially at base; operculum membranous, plicate; limen short, fleshy; pollen spheroid to prolate, reticulate, 6-12 c olporate; styles slender, stigmas mostly capitate. Fruits mostly small dark purplish berries, or greenish, yellow, orange, or reddish, sometimes dehiscent capsules or capsule-like berries; seeds reticulate, alveolate, or transversely grooved with the ridges often rugulose. Germination epigeal, very rarely hypogeal. Chloroplast intron rpoC1 present or absent. Chromosomes mostly n=6, but also 7, 9, (11? ), or 12, with limited tetraploidy based on x=6. 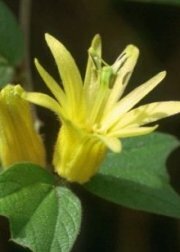 Subgenus Decaloba comprises ca. 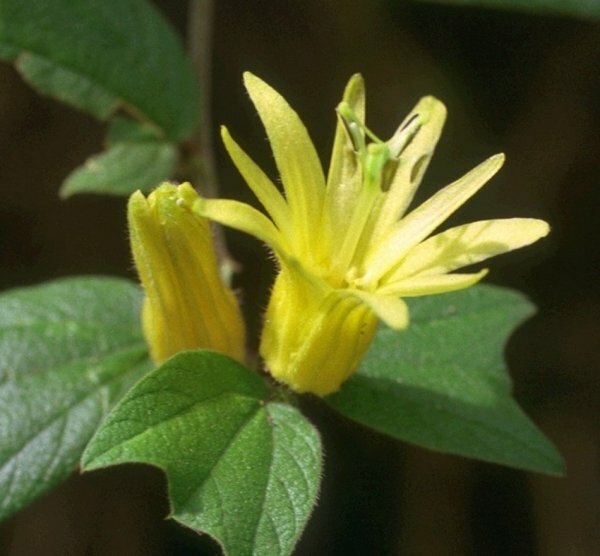 235 species and is currently divided into eight supersections (Feuillet & MacDougal 2003 ), seven of which are found in the New World (224 species), while the eighth supersection comprises all Old World members (21 species). 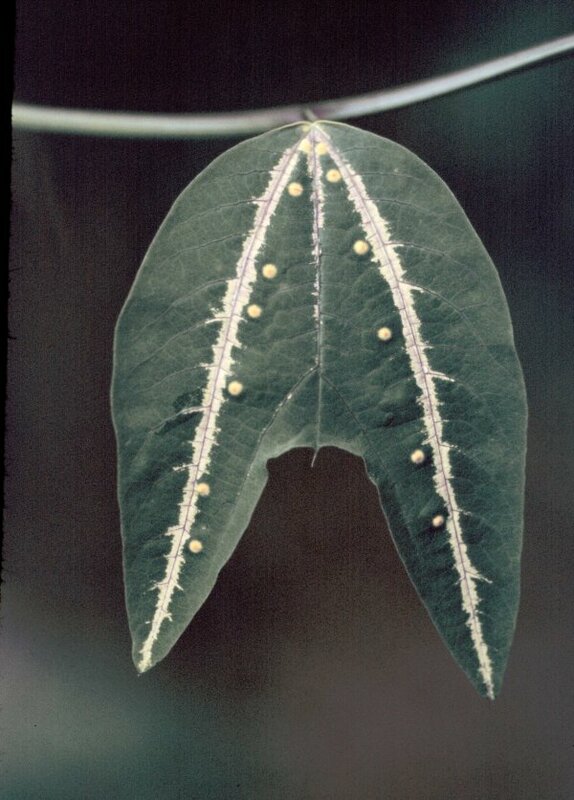 Passiflora boenderi leaf with egg mimic nectaries.